Kapil Sharma is all set and raring to go! After struggling with addiction and related mental issues, he seems to be determined to rise from ashes like phoenix and prove to his naysayers that he will forever be the king of comedy on small screen. Kapil now will be seen with Krushna Abhishek and Bharti Singh in a show which will come out in October and he is leaving no stone unturned to make sure that he gets into the right space mentally and physically before he embarks on his new journey. 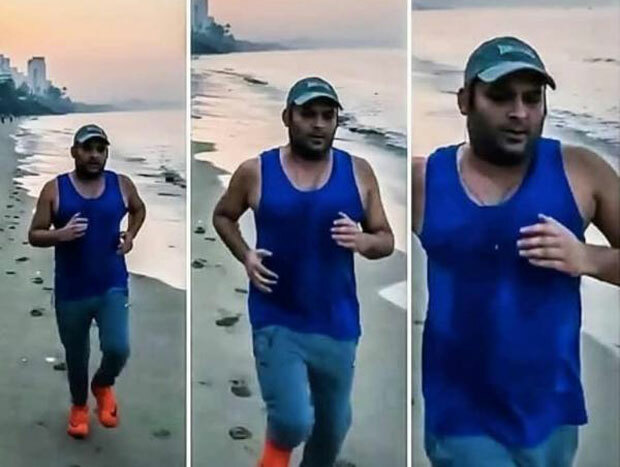 Kapil was spotted taking a run across a beach in the city yesterday and it looked it he was determined to get his MOJO back! We wish, pray and hope that he does that and entertain us again with his brilliant sense of humour on television. Unless you are living under rock you would know that Kapil had a breakdown and indulged in a drunken brawl last year with Sunil Grover on a plane. It was the beginning of end for Kapil as he continued to go downhill from there. Though Kapil was hosting a show: Family Time With Kapil Sharma post fighting with producers of his earlier show, he could not sustain it. He got sucked into the black hole of depression and well had to take a break after many a public breakdown scenes. Things got really ugly after he lashed out at a journalist online. He threatened and abused him and well, it became apparent the extent of his sickness. Kapil recently produced a movie Son of Manjeet Singh in Punjab which will be releasing on October 12, 2018. Also Read: Kapil Sharma may be in trouble as sponsors may seek refund from his comeback show? Did Aishwarya Rai Bachchan advise husband Abhishek Bachchan on his movies Manmarziyan and Paltan? Do First Impressions REALLY Matter?